"The people of Ireland have always had a pride and passion for their land and traditions. When they immigrated they maintained these traditions and weaved them into the fabric of their new communities," said Kyle Betit, a Senior Genealogist at Ancestry.com and expert in Irish genealogy. "Nearly thirty-five million** Americans today claim some Irish ancestry. With eastern Massachusetts having become home to many Irish immigrants, these new records will hopefully provide a better understanding to the millions of Irish Americans in the country looking to discover their family's history and heritage." Boston is home to many great Irish Americans who have influenced everything from politics to sports. New England Patriots quarterback Tom Brady's 2nd great-grandfather, Patrick Buckley, was from Inniscarra, County Cork, Ireland, while former President John F. Kennedy's ancestral roots can be found in counties Wexford and Limerick. No matter your ancestors' role in history, the new record collections will help you learn more about the names and places that are a part of your Irish heritage. "The additions to our Irish Catholic Church collections are a valuable set of records for those who are looking for information about their Irish ancestors before they came to America," said Betit. "Because Ireland's population was overwhelmingly Roman Catholic -- almost 78 percent of the population in 1861 -- the Catholic parish registers are particularly valuable sources of information for Irish family history." To explore your Irish ancestry, visit http://www.ancestry.com/irish. In addition to helpful research guides, web tutorials and a simple 1-2-3 approach to getting started, Ancestry.com offers a free 14-day World Deluxe membership, which provides access to all Ancestry.com records. Ancestry.com is the world's largest online family history resource with approximately 2.7 million paying subscribers across all its websites. More than 13 billion records have been added to the Ancestry.com sites and users have created more than 55 million family trees containing more than 5 billion profiles. In addition to its flagship site www.ancestry.com, the company operates several global Ancestry international websites along with a suite of online family history brands, including Archives.com, Fold3.com, Newspapers.com, and offers the AncestryDNA product, sold by its subsidiary, Ancestry.com DNA, LLC, all of which are designed to empower people to discover, preserve and share their family history. This press release contains forward-looking statements. Forward-looking statements involve a number of risks and uncertainties that could cause actual results to differ materially from those anticipated by these forward-looking statements. Such risks and uncertainties include a variety of factors, some of which are beyond the company's control. In particular, such risks and uncertainties include the company's ability to acquire content and make it available online and its ability to add features and provide value to satisfy customer demand. Information concerning additional factors that could cause events or results to differ materially from those projected in the forward-looking statements is contained under the caption "Risk Factors" in our Annual Report on Form 10-K filed with the Securities and Exchange Commission on February 28, 2014, and in discussions in other of its Securities and Exchange Commission filings. These forward-looking statements should not be relied upon as representing our views as of any subsequent date and we assume no obligation to publicly update or revise these forward-looking statements. Hundreds of thousands of Irish immigrated to the United States in the 1600s and the 1700s, but the greatest period of immigration occurred between 1820 and 1860, when nearly two million Irish immigrants came to America. 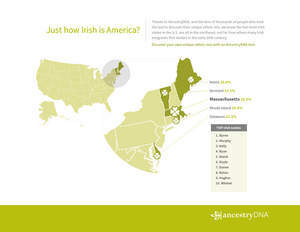 Today, Massachusetts accounts for 20 percent of the U.S. population that claims Irish descent.